Summer is fast approaching, which means it’s time to travel to new places and embark on a wondrous adventure (even if it’s only in your living room, curled up with a cool drink and a great book). 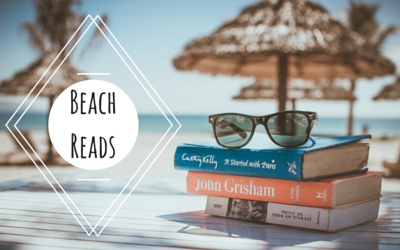 We’ve put together a list of some more eclectic beach reads to help you get a jump-start on your Summer Reading goals. So leave your highbrow, literary nonsense at the door and enjoy some of the best new releases in genre fiction— with a bonus memoir thrown in for good measure. Equal parts "Miss Peregrine’s Home For Peculiar Children" and "Geek Love," "Magruder’s Curiosity Cabinet" tells the story of Kitty, a young girl whose mother mysteriously vanishes during their trip to Coney Island in 1904. Finding herself alone, Kitty stumbles upon Magruder’s Curiosity Cabinet — a sideshow of human oddities who agree to help her locate her missing mother. It has plenty of humor, intrigue and an eccentric, Lovecraftian creepiness that lingers underneath this fascinating world. H.P. Wood has crafted an amazing ensemble cast, so if character-driven stories are your jam, this one is a must read. Set in a hidden library connected to multiple parallel universes, "The Invisible Library" follows Irene, an immortal librarian sent on a quest to Victorian England to retrieve a rare manuscript while accompanied by her trainee Kai. However, this isn’t your typical England, as there are all sorts of supernatural creatures and mechanical anachronisms. "The Invisible Library" is a page turner that effortlessly blends elements of "Doctor Who" and "Ghostbusters" into an imaginative adventure that will make you wish you could join the hallowed ranks of the librarians. It all started with Draco Incendia Trychophyton: a plague that causes gold and black markings on the skin and develops into a fatal conflagration that sets the world’s populous ablaze. There is no cure. Here enters Mary Poppins-esque heroine Harper Grayson, a school nurse who finds out she is both infected and pregnant. Now, Harper just needs to survive until she can give birth to her child — hopefully infection-free. Both heart wrenching and intense, Joe Hill’s latest work provides an innovative portrait of the future with plenty of captivating, horror-infused weirdness. Kansas City writer Jason Aaron brings Doctor Strange to new, reality bending heights in this contemporary Marvel series. The unknown Empirikul are set on purifying magic from every dimension, and it’s up to Dr. Strange, as Earth’s Sorcerer Supreme, to protect the planet and save magic itself. Artist Chris Bachalo has done a spectacular job of visual worldbuilding with bold color selections and a meticulous attention to detail. Be sure to give this a read before the upcoming Doctor Strange film starring Benedict Cumberbatch premieres this November. Bestselling author Mary Kubica does it again in this fast-paced and twisted psychological thriller that will delight fans of both Gillian Flynn and Paula Hawkins. When Quinn’s friend and roommate Esther goes missing in downtown Chicago, she finds a mysterious letter in Esther’s personal possessions, which makes Quinn question everything she knew about her friend. Meanwhile, a young man in a small Michigan harbor town is drawn to a beautiful and mysterious woman new to town, who isn’t all she seems. This book is a suspenseful thrill ride perfect for a summer afternoon! Known for her roles as Maritza Ramos on "Orange is the New Black" and Lina on "Jane the Virgin," actress and activist Diane Guerrero has channeled her talent towards writing in this emotional and personal memoir of her experiences as the child of undocumented immigrants. Guerrero’s biggest fear became a reality at the young age of 14, when her parents were deported while she was in school. Guerrero’s own struggles bring to light the stories of countless children born in the U.S. to undocumented immigrants and foster a sense of humanity with the issues surrounding immigration. It is a truly memorable read. When new girl Amanda Hardy meets Grant, Amanda can’t help but like him as they spend more and more time together. However, as much as she wants to open up to him, Amanda is afraid to share all of her secrets — like how at her former school, she was known as Andrew. "If I Was Your Girl" is a contemporary young adult novel about being true to yourself and finding acceptance, with a love story anyone can root for. This book is particularly inclusive because not only is the main character a trans* woman, as well as the author, and the cover model! "A Front Page Affair" is the first book in a brand new mystery series about a young journalist named Capability “Kitty” Weeks. Set in 1915 New York just after the sinking of the Lusitania, Kitty would love nothing more than to report on stories other than fashion and society gossip. However, her roles as a female journalist are limited ... that is, until a man is murdered at a high society picnic on her beat! Determined to show what type of reporting she can really do, Kitty is thrown into a wartime conspiracy that threatens the stability of her country as well as her own privileged life.